« Vintage and Retro Stuff For Sale – Contests Coming Up Too! Finally coming to grips with the end of my great retro weekend on Long Island and discovering their wonderful collection of luncheonettes, I could not resist trying to fit one more vintage LI location into my visit – the Star Confectionery in Riverhead, NY just at the fork of Long Island. Originally built in 1911 as a candy store and owned by the same family since the 1920s, we had a late breakfast here just before they closed up for the day. Take note of things like this if you want to get a good photo of vintage neon while it’s still burning! 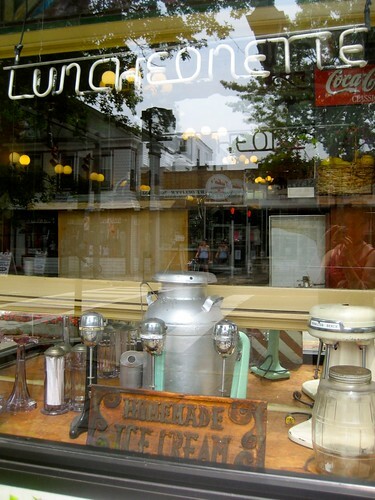 I did not realize they’d shut the signs off, but being my fave word I had to snap a photo of the window anyhow. We slipped into a wooden booth and served by prompt and friendly folks. Having had my fill of standard breakfast fare, I opted for an unusual combo that somehow seemed just right. 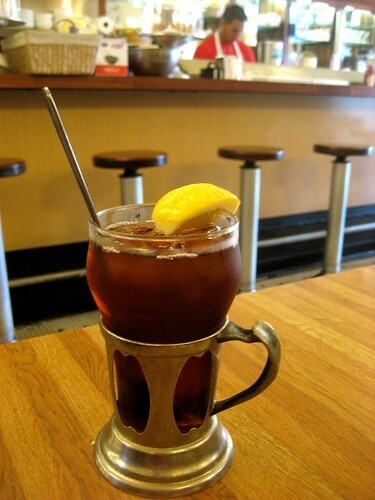 Iced tea and a split n grilled corn muffin. Grilled muffins are the best! 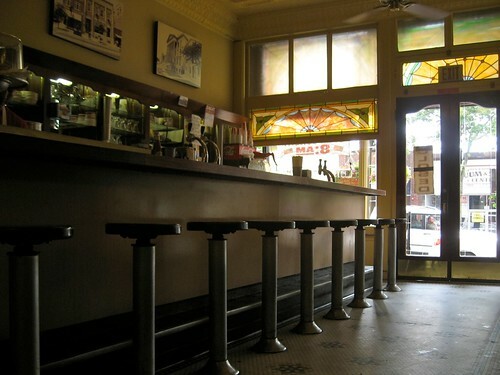 You can see from the photo below the wonderfully kept original stained glass windows, authentic counter stools and classic marble countertop. Not to mention the great tiled floor. And unfortunately you can also see the reflection of the “Closed” sign, which reminded us it was time to head back to the mainland. Bidding adieu to the Star we could not leave town without a quick walk around what once was a bustling commercial district. It was extra quiet because of Sunday but a bit sad to see all the wonderful yet vacant storefronts. Not to say there aren’t things going on, and in fact my sidekick Suzanne told me that the Vail Levitt Music hall around the corner is a historic theatre where Thomas Edison experimented with sound movies almost 100 years ago. I was not able to snap a photo of this notable place, but you can read the detailed history of the theatre on the Vail-Leavitt Music Hall website. 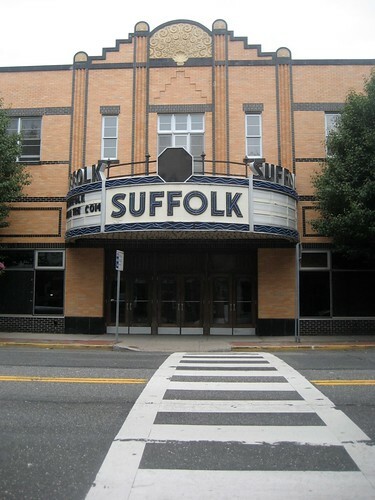 One great sign I was able to snap a photo of was of the Suffolk Theatre, built in 1933. Thanks to the information on that great resource Cinema Treasures, I’m happy to report that “The long delayed restoration of the theatre began in August 2010” good news! I know that there were other cool vintage places that we missed, diners we didn’t find, but we did pack a lot of fun into a long weekend! So there we go, the true very end of a wonderful retro roadmap vintage Long Island weekend that I’ve somehow managed to stretch out and make last for the entire summer, like a wonderful piece of salt water taffy. 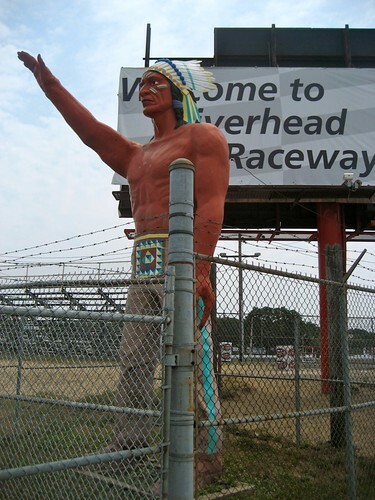 Our last retro roadside find seemed the most appropriate, the Riverhead Raceway Indian, who looks like he’s saying, “Thank you for visiting our fair lands, please come again”! Love it Beth! 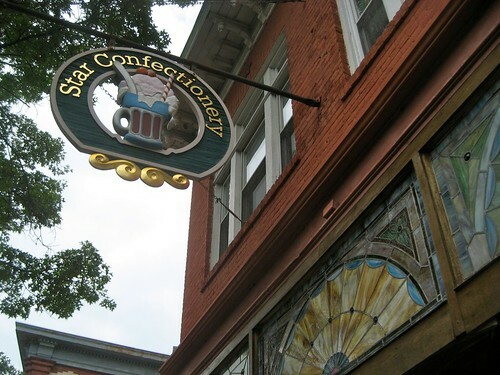 I have never been to the Star Confectionery….can’t wait to go there!